Heat waffle maker with 8-inch-square cooking surface on Medium-High heat setting. In medium bowl, mix both cheeses, basil and oregano; set aside. In 1 1/2-quart saucepan, heat pizza sauce over low heat, stirring occasionally, until hot. Place in small serving bowl. If using crescent rolls: Unroll both cans of dough onto work surface. Separate each crosswise, making 4 (7x6-inch) rectangles; firmly press perforations to seal. If using dough sheets: Unroll both cans of dough onto work surface. Cut each rectangle crosswise making a total of 4 (7x6-inch) rectangles. 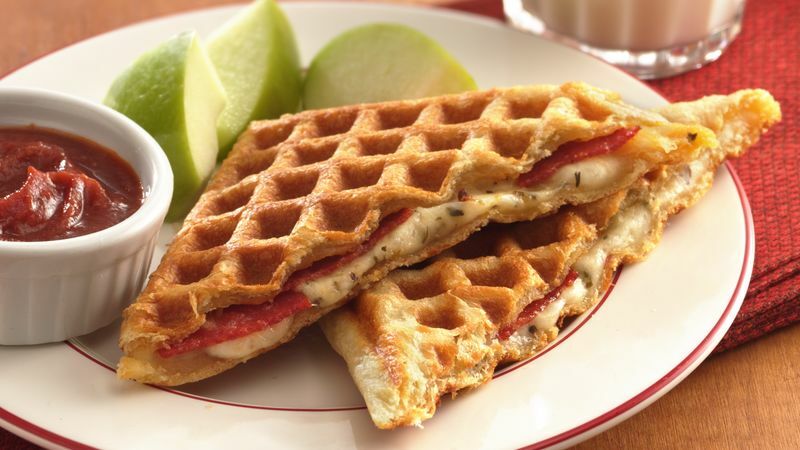 Place 1 dough rectangle on bottom surface of heated waffle maker, being careful not to open up perforations. Quickly sprinkle 1 cup cheese mixture evenly on top of dough. Place 16 slices of pepperoni evenly over cheese mixture. Top with another dough rectangle; close waffle maker. Bake 2 to 3 minutes or until sandwich is golden brown. With pancake turner, remove from waffle maker; place on cutting board. Cool 30 seconds before cutting. Cut into 4 square sandwiches or 8 triangular snacks. Repeat with remaining dough, cheese mixture and pepperoni. Serve warm with pizza sauce for dipping.